Often from the onset of bedsores, also described as pressure sores or decubitus ulcers, victims in a hospital or nursing home are led to believe it is their fault. They may be led to believe they don’t have a right to sue and that there is no chance for compensation. It’s simply not true. Below are some facts about lawsuits and your rights as a patient and victim. The defendant’s insurance company will ask you for authorizations to obtain your medical records. DON’T DO IT. Let your attorney release your records after he or she has reviewed them. It’s best not to offer information by yourself. Use our Free Bedsore Lawsuit Evaluator> or feel free to contact me for more information. In two separate cases, a Maryland appeals court rules that a nursing home does not have to pay attorney’s fees to an attorney appointed to represent residents in guardianship proceedings. Rather, the state must pay the fees, at a much lower reimbursement rate. In Re Jon (Md. Ct. Spec. App., No. 361, Feb. 8, 2019) and In Re Selby (Md. Ct. Spec. App., No.360, Feb. 8, 2019). When family members were not able to assist with the Medicaid applications of two nursing home residents, the nursing home filed petitions for guardianship of the residents, Hyung Bok Jon and Margo Selby. The court appointed attorney Nina Helwig to represent both residents. The court-appointed guardians for the residents and Ms. Helwig filed a petition for attorney’s fees. Ms. Helwig claimed that because both residents were indigent and could not pay the fees, the nursing home should pay them. The nursing home opposed the fee petitions, arguing that the state is required to pay attorney’s fees when the ward is indigent. State law requires the state to pay attorney’s fee in a guardianship of the person case, but there is no attorney’s fee provision in guardianship of the property cases. A state rule interpreting the statute, however, provides that the state must pay attorney’s fees. Ms. Helwig argued that the nursing home benefited from her services because the residents needed a guardian to qualify for Medicaid and that the rate paid by the state was $75 per hour, which is $175 less than her hourly rate. The trial court ordered the nursing home to pay the attorney’s fees in both cases, and the nursing home appealed. The Maryland Court of Special Appeals reverses both cases, holding that the state is required to pay attorney’s fees for indigent clients in guardianship cases. According to the court, the rule requiring the state to pay attorney’s fees is not inconsistent with the statute simply because the statute does not make a provision for attorney’s fees. The Social Security Administration has announced a 2.8 percent increase in benefits in 2019, the largest increase since 2012. The change will put an additional $468 anually in the pocket of the average retired beneficiary. Cost of living increases are tied to the consumer price index, and an upturn in inflation rates and gas prices means recipients get a boost in 2019. The 2.8 percent increase is higher than last year’s 2 percent rise and the .3 percent increase in 2017. The average monthly benefit of $1,422 in 2018 will increase by $39 a month to $1,461 a month for an individual beneficiary, or $468 yearly. The cost of living change also affects the maximum amount of earnings subject to the Social Security tax, which will grow from $128,700 to $132,900. And there is more good news: Unlike last year’s increase, the additional income should not be entirely eaten up by higher Medicare Part B premiums. The standard monthly premium for Medicare Part B enrollees will increase only $1.50 to $135.50. For 2019, the monthly federal Supplemental Security Income (SSI) payment standard will be $771 for an individual and $1,157 for a couple. Most beneficiaries will be able to find out their cost of living adjustment online by logging on to my Social Security in December 2018. While you will still receive your increase notice by mail, in the future you will be able to choose whether to receive your notice online instead of on paper. For more on the 2019 Social Security benefit levels, click here. In 2019, the spouse of a Medicaid recipient living in a nursing home (called the “community spouse”) may keep as much as $126,420 without jeopardizing the Medicaid eligibility of the spouse who is receiving long-term care. Called the “community spouse resource allowance,” this is the most that a state may allow a community spouse to retain without a hearing or a court order. While some states set a lower maximum, the least that a state may allow a community spouse to retain in 2019 will be $25,284. Meanwhile, the maximum monthly maintenance needs allowance for 2019 will be $3,160.50. This is the most in monthly income that a community spouse is allowed to have if her own income is not enough to live on and she must take some or all of the institutionalized spouse’s income. The minimum monthly maintenance needs allowance for the lower 48 states remains $2,057.50 ($2,572.50 for Alaska and $2,366.25 for Hawaii) until July 1, 2019. TO LEARN MORE ABOUT THE BENEFITS OF MEDICAID PLANNING click here. In 2019, a Medicaid applicant’s principal residence will not be counted as an asset by Medicaid unless the applicant’s equity interest in the home is less than $585,000, with the states having the option of raising this limit to $878,000. In order to qualify for Medicaid, a nursing home resident’s income must not be above a certain level. Most states allow individuals to spend down their excess income on their care until they reach the state’s income standard. But other states impose an “income cap,” which means no spend-down is allowed. Protecting your assets should be on the radar for every baby boomer. It will help your elder years be less stressful and offer you more lifestyle and health care options. However, don’t let that sideline you from looking after your parents assets as they age and are less capable of managing their savings and investment accounts. Below is an article from The New York Times revealing what can happen if accounts and your involvement are overlooked. Tracey Dewart faced a daunting task last summer: moving her 84-year-old mother, Aerielle, from her Manhattan apartment to an assisted living facility in Brooklyn. Her mother, who has Alzheimer’s, didn’t want to go, but there was little choice after she was found wandering near her home on the Upper East Side several times. And she was about to confront another ordeal — one that could serve as a cautionary tale for anyone who helps manage their parents’ money and, more broadly, anyone who does business with an investment broker. To help pay for her mother’s care, Ms. Dewart relied on an investment account at J.P. Morgan Securities that her 89-year-old father, Gordon, opened at least eight years ago. The account was already paying expenses for Ms. Dewart’s father — who, after two strokes, was living in the residence that his wife was moving to — and for Ms. Dewart’s younger sister, who lives in a community for adults with developmental disabilities. Around the time of her mother’s move, Ms. Dewart noticed what looked like unusual activity in the account, which she and her older sister had overseen for about four years. A closer look revealed that it was down $100,000 in a month. “My own accounts were rallying, so I thought this was strange,” she said. She notified the firm that something seemed awry. As someone who does research and policy analysis for a living, she also put her own skills to work. She pored over piles of statements and trade confirmations, built spreadsheets and traded phone calls and emails with the broker who handled the account, Trevor Rahn, his manager and the manager’s manager. She hired a lawyer and worked with a forensic consultant. After about six months, she learned that the account, worth roughly $1.3 million at the start of 2017, had been charged $128,000 in commissions that year — nearly 10 percent of its value, and about 10 times what many financial planners would charge to manage accounts that size. In August 2017 alone, Mr. Rahn had sold two-thirds of the portfolio, or about $822,000, and then reinvested most of the proceeds, yielding about $47,600 in commissions, according to monthly financial statements and an analysis by Genesis Forensic Consulting, the firm Ms. Dewart’s lawyer hired. A statement listed all 344 trades that month as “unsolicited” — meaning, in Wall Street terms, that they were the customer’s idea, not the broker’s. But Ms. Dewart said she had not authorized the transactions and had only discussed a few specific ideas with Mr. Rahn, including possibly selling some Exxon shares if cash was needed. An August 2017 statement showed that the Dewarts’ portfolio was down about $100,000 in a month and that roughly two-thirds of the stocks in it had been sold in that time. Something else was unusual. Mr. Rahn was selling stocks in small batches multiple times a day. In April 2017, he sold between 75 and 125 shares of Exxon eight times in one day, rather than all at once, generating commissions on each sale. Ms. Dewart also discovered that the Exxon stock and other investments were being held in a margin account, which lets customers use borrowed shares to make bigger bets, potentially amplifying gains and losses. She said she never approved opening such an account. “I had implicitly trusted Trevor because my father did,” she said. Her father had first put his investments in Mr. Rahn’s care when the broker was at Deutsche Bank, and had followed him to J.P. Morgan in 2010. About five months after Ms. Dewart questioned Mr. Rahn’s handling of the account, J.P. Morgan had canceled 681 of the 1,499 transactions for 2017, crediting about $84,000 in commissions, according to Genesis. That left 818 trades and commissions totaling about $44,000 for the year — about 3.8 percent of the account’s value, still triple what many financial planners would charge. Ms. Dewart considered taking J.P. Morgan to arbitration as allowed by the customer agreement, but she settled instead for a sum that she is prohibited from discussing. Mr. Rahn, who still works at J.P. Morgan, and the two managers at the firm with whom Ms. Dewart dealt did not respond to emails seeking comment. Ms. Dewart’s experience leaves many questions unanswered. Her broker was not authorized to trade without permission, so why did he? Why was such a large stock sold in so many small transactions? Were other customers subject to similar trading activity? She said a firm manager told her that there had been a system error — what kind? Excessive and unauthorized trading are among the top complaints in customer arbitration cases, according to the Financial Industry Regulatory Authority, or Finra. Just last year, the Securities and Exchange Commission issued an alert about churning, a term for excessive trading, to help investors identify warning signs. There were 166 cases of unauthorized trading in 2017, 209 in 2016 and 145 in 2015, Finra said. There were 142 complaints for excessive trading in 2017. Commission-based accounts like the one Ms. Dewart had can be economical for investors who don’t require many changes to their portfolios. But because brokers are only paid each time they conduct a transaction, their interests are not necessarily aligned with those of their clients. Big brokerage and financial services firms have been shifting to accounts that charge a flat annual fee for management services, reducing the potential for conflicts of interest. The shift accelerated in anticipation of a consumer-protection rule crafted by the Department of Labor during the Obama administration that required all financial professionals to put their customers’ interests ahead of their own, at least when handling retirement accounts. Merrill Lynch went as far as banning commission-based retirement accounts. The rule was struck down by a federal appeals court in June, and Merrill has said it was considering reversing that policy. In April, the S.E.C. proposed a new rule that it said would require brokers to put their clients’ interests first. Consumer advocates have come out against the proposal, arguing that it does not go far beyond what is already required of brokers. A stronger rule may not have helped Ms. Dewart, but she said the current structure was stacked against consumers. ITHACA, N.Y. — Most nursing homes had fewer nurses and caretaking staff than they had reported to the government for years, according to new federal data, bolstering the long-held suspicions of many families that staffing levels were often inadequate. The records for the first time reveal frequent and significant fluctuations in day-to-day staffing, with particularly large shortfalls on weekends. On the worst staffed days at an average facility, the new data show, on-duty personnel cared for nearly twice as many residents as they did when the staffing roster was fullest. The payroll records provide the strongest evidence that over the last decade, the government’s five-star rating system for nursing homes often exaggerated staffing levels and rarely identified the periods of thin staffing that were common. Medicare is now relying on the new data to evaluate staffing, but the revamped star ratings still mask the erratic levels of people working from day to day. tracks staffing levels at the skilled nursing facility. Nearly 1.4 million people are cared for in skilled nursing facilities in the United States. When nursing homes are short of staff, nurses and aides scramble to deliver meals, ferry bedbound residents to the bathroom and answer calls for pain medication. Essential medical tasks such as repositioning a patient to avert bedsores can be overlooked when workers are overburdened, sometimes leading to avoidable hospitalizations. David Gifford, a senior vice president at the American Health Care Association, a nursing home trade group, disagreed, saying there are legitimate reasons staffing varies. On weekends, for instance, there are fewer activities for residents and more family members around, he said. The payroll records show that even facilities that Medicare rated positively for staffing levels on its Nursing Home Compare website, including Beechtree, were short nurses and aides on some days. On its best staffed days, Beechtree had one aide for every eight residents, while on its lowest staffed days, there was only one aide for 18 residents. Nursing levels also varied. Mr. Camerota wrote that weekend staffing is a special challenge as employees are guaranteed every other weekend off. “This impacts our ability to have as many staff as we would really like to have,” he wrote. The Centers for Medicare & Medicaid Services discouraged comparison of staffing under the two methods and said no one should expect them to “exactly match.” The agency said the methods measure different time periods and have different criteria for how to record hours that nurses worked. The nursing home industry also objected, with Mr. Gifford saying it was like comparing Fahrenheit and Celsius temperatures. Of the more than 14,000 nursing homes submitting payroll records, seven in 10 had lower staffing using the new method, with a 12 percent average decrease, the data show. And as numerous studies have found, homes with lower staffing tended to have more health code violations — another crucial measure of quality. Still, since 2014, health inspectors have cited one of every eight nursing homes for having too few nurses, federal records show. Sandy Ferreira, who makes health care decisions for Effie Hamilton, a blind resident, said Ms. Hamilton broke her arm falling out of bed and has been hospitalized for dehydration and septic shock. “Almost every problem we’ve had on the floor is one that could have been alleviated with enough and well-trained staff,” Mrs. Ferreira said. Beechtree declined to discuss individual residents, but said it had investigated these complaints and did not find inadequate staffing on those days. Mr. Camerota also said that Medicare does not count assistants it hires to handle the simplest duties like making beds. Mr. Hugo agreed that Beechtree has increased daytime staffing during the week under the prodding of his council. On nights and weekends, he said, it still remained too low. His wife has Alzheimer’s, uses a wheelchair and no longer talks. She enjoys music, and Mr. Hugo placed earphones on her head so she could listen to her favorite singers as he spoon-fed her lunch in the dining room on a recent Sunday. This article was produced in collaboration with Kaiser Health News, an editorially independent program of the Kaiser Family Foundation. The author is a reporter for Kaiser Health News. Trusts can help you control your assets and build a legacy. Trusts can help pass and preserve wealth efficiently and privately. Trusts can help reduce estate taxes for married couples. Gain control over distribution of your assets by using trusts. With a trust, you can ensure that your retirement assets are distributed as you’ve planned. If you haven’t stopped to consider how a trust may help you pass your wishes and wealth on, you could be making a critical estate planning mistake. Especially for individuals with substantial assets, protecting wealth for future generations should be top of mind. A trust is a legal structure that contains a set of instructions on exactly how and when to pass assets to trust beneficiaries. There are many types of trusts to consider, each designed to help achieve a specific goal. An estate planning professional can help you determine which type (or types) of trust is most appropriate for you. However, an understanding of the estate planning goals that a trust may help you achieve is a good starting point. Also, please note that this information is based on current tax law. An effective trust begins with documentation carefully drafted by a qualified attorney with knowledge of your specific situation as well as current laws. Without the appropriate documentation, you and your beneficiaries may not reap the benefits of a trust, some of which are described below. Delays: Probate proceedings will take time, some may take longer than a year. Additionally, if you own property located in states other than your home state, probate may be required in each such state. Publicity: The probate process is public. When your will is admitted to probate, it becomes a public record, to be viewed by anyone who wishes to review it. Such transparency can create unwanted scrutiny. With proper planning, the delays, costs, and loss of privacy can often be avoided. You may be able to avoid probate and gain greater control over how your estate is settled by establishing and funding a revocable trust. Because the trust is revocable, it can be altered or amended during the grantor’s2 lifetime. After a grantor’s death, the trust acts as a will substitute and enables the trustee to privately and quickly settle the grantor’s estate without going through the probate process with respect to assets held in the trust. A grantor can also give the trustee the power to take immediate control of the assets held in trust in the event that the grantor becomes incapacitated (and the grantor generally has the ability to define what constitutes “incapacity” within the trust document). This provision can save heirs the time, financial cost, and emotional distress of going to court to request a conservatorship or guardianship over a loved one. Finally, revocable trusts are dissolvable, meaning the grantor can generally pull assets out of the trust at any point during the grantor’s lifetime. If you have substantial assets, you may want to consider creating and funding an irrevocable trust during your lifetime. Because the trust is irrevocable, in almost all circumstances, the grantor cannot amend the trust once it has been established, nor can the grantor regain control of the money or assets used to fund the trust. The grantor gifts assets into the trust, and the trustee administers the trust for the trust beneficiaries based on the terms specified in the trust document. Significantly, while the gift could use up some or all of a grantor’s lifetime gift tax exclusion, any future growth on these assets generally will not be includable in the grantor’s estate and therefore will escape estate taxes at the grantor’s death. The individual lifetime federal gift tax exclusion is set at $11.18 million for 2018. Holding life insurance proceeds outside your estate. Generally, without trust planning, the death benefit payout from a life insurance policy would be considered part of an estate for the purposes of determining whether there are estate taxes owed. However, this is not the case if the policy is purchased by an independent trustee and held in an irrevocable life insurance trust (ILIT) that is created and funded during the grantor’s lifetime, with certain limitations (please consult your attorney). Despite not being subject to estate taxes at death, the life insurance proceeds received by the ILIT can be made available to pay any estate taxes due by having the insurance trust make loans to, or purchase assets from, the estate. Such loans or purchases can provide needed liquidity to the estate without either increasing the estate tax liability or changing the ultimate disposition of the assets, as long as the life insurance trust benefits the same beneficiaries as the estate does. In particular, this means that illiquid assets like real estate, or tax-inefficient assets like taxable retirement accounts, may not have to be sold or distributed quickly to meet the tax obligation. Ensuring protection from creditors, including a divorcing spouse. An irrevocable trust, whether created during your lifetime or at your death, can include language that protects the trust’s assets from the creditors of, or a legal judgment against, a trust beneficiary. In particular, assets that remain in a properly established irrevocable trust are generally not considered marital property. Therefore, they generally won’t be subject to division in a divorce settlement if one of the trust’s beneficiaries gets divorced. However, a divorce court judge may consider the beneficiary’s interest in the trust when making decisions as to what constitutes an equitable division of the marital property that is subject to the court’s jurisdiction. Keep in mind, though, that irrevocable trusts are permanent. “The trust dictates how the funds are distributed, so you want to fund this type of trust only with assets that you are certain you want to pass to the trust beneficiaries, as specified by the terms of the trust,” cautions Weaver. For a married couple, a revocable trust may be used as part of the larger plan to take full advantage of both spouses’ federal and/or state estate tax exclusions. Upon the death of a spouse, the assets in a revocable trust can be used to fund a family trust—also known as a “credit shelter,” “bypass,” or “A/B” trust—up to the amount of that spouse’s federal or state estate tax exclusion. The assets held in the family trust can then grow free from further estate taxation at the death of the surviving spouse. Meanwhile, the balance of the assets in the revocable trust can be transferred to the surviving spouse free of estate tax pursuant to the spousal exemption. At the death of the surviving spouse, of course, these assets may be included in the surviving spouse’s estate for estate tax purposes. The estate tax-free growth potential for funds in a family trust can be significant. Say, hypothetically, that you and your spouse live in Florida, which does not have a separate state-level estate tax, and have a net worth of $12 million. If one of you dies in 2018, that spouse’s revocable trust can fund the family trust with $11.18 million without paying any federal estate tax. Over the next 20 years, this $11.18 million could grow in value, all of which would remain outside the surviving spouse’s taxable estate. Distributions for specific purposes. A grantor can stipulate that the trustees of a trust shall make money available to children or grandchildren only for college tuition or perhaps for future health care expenses. Age-based terminations. This provision can stipulate that the trust’s assets shall be distributed to heirs at periodic intervals—for example, 30% when they reach age 40, 30% when they reach age 50, and so on. If you are charitably inclined, you may also want to consider establishing a charitable remainder trust, which allows the grantor, and possibly the grantor’s spouse and children, to receive an annual payment from the trust during his or her lifetime, with the balance transferring to the specified charity when the trust terminates. The grantor may also receive an income tax charitable deduction based on the charity’s remainder interest when property is contributed to the charitable remainder trust. For more on charitable trusts, read Viewpoints on Fidelity.com: Charitable giving that gives back. You may be concerned that a beneficiary of a retirement account will liquidate that account and incur a large income tax obligation in that year as a result. To help alleviate that concern, by naming a properly created trust as the beneficiary of a retirement account at the grantor’s death, the trustee can limit withdrawals to the retirement account’s required minimum distributions (RMDs), required of each beneficiary. You may be concerned that if your surviving spouse remarries, your assets could end up benefiting their new family rather than your own loved ones. In this case, a qualified terminable interest property (QTIP) trust provision can be used to provide for a surviving spouse while also ensuring that at their subsequent death, the remainder of the trust’s assets are ultimately transferred to the beneficiaries identified by the grantor in the trust document. The purpose of establishing a trust is to ultimately help you better realize a vision for your estate and, in turn, your legacy. Therefore, it’s important to let your goals for your estate guide your discussion with your attorney and financial adviser as they help determine what kind of trust and provisions make sense for you. It is vitally important that the trust be properly drafted and funded, so that you and your beneficiaries can fully realize all the benefits available. Let me know if you have any questions or need help setting up the best type of trust for you and your family. A recent study has found that people enrolled in a Medicare Advantage plan were more likely to enter a lower-quality nursing home than were people in traditional Medicare. The study raises questions about whether Medicare Advantage plans are influencing beneficiaries’ decisionmaking when it comes to choosing a nursing home. Medicare Advantage plans, an alternative to traditional Medicare, are provided by private insurers rather than the federal government. The government pays Medicare Advantage plans a fixed monthly fee to provide services to each Medicare beneficiary under their care, and the services must at least be equal to regular Medicare’s. While the plans sometimes offer benefits that original Medicare does not, the plans usually only cover care provided by doctors in their network or charge higher rates for out-of-network care. The study, conducted by researchers at Brown University School of Public Health, examined Medicare beneficiaries entering nursing homes between 2012 and 2014. Using Medicare’s Nursing Home Compare website as the measure of quality, the study found that beneficiaries in Medicare Advantage plans tended to enter lower quality nursing homes than beneficiaries in original Medicare. Information on exactly why this is happening is “of vital policy importance,” according to the study’s authors. They recommend gathering more information about Medicare Advantage nursing home claims and re-hospitalization rates and requiring Medicare Advantage plans to be more transparent about the quality of nursing homes in their networks. Copyright 2016 This article is provided as legal information, not legal advice and our law firm makes no claims, promises or guarantees about the accuracy,completeness, or adequacy of the information contained in in this article. The distribution or acceptance of this article does not constitute an attorney-client relationship with our law firm. The law also addresses flaws in the guardianship system that have led to elder abuse. The law enables the government to provide demonstration grants to states’ highest courts to assess adult guardianship and conservatorship proceedings and implement changes. After a lifetime of agricultural work on the U.S. mainland, Ausberto Maldonado retired home to a suburb of San Juan, Puerto Rico. But he has diabetes, and especially since Hurricane Maria, has been struggling to get by. Straddled across Ausberto Maldonado’s backyard in Bayamon, Puerto Rico, a suburb of San Juan, is a nagging reminder of Hurricane Maria’s destructive power. “See, that tree broke off that branch, which is as thick as a tree — and now it’s in my yard,” says Maldonado, a 65-year-old retiree. Rats scurry from under the downed tree, preventing Maldonado from hanging his laundry. To get the tree removed, he must show up in person at a local government office. But the diabetic ulcers on his feet make it painful to walk. After a lifetime of work on the U.S. mainland picking corn and asparagus and processing chickens in poultry plants, Maldonado returned to Puerto Rico a decade ago to help care for his ailing mother, who has since died. Today the retiree finds himself living day-to-day on the island. He receives $280 a month in Social Security and $89 a month in food stamps — or about $3 a day for food. Six months after Hurricane Maria devastated Puerto Rico and its economy, the daily indignities are piling up, especially for people who are frail or elderly. Many are finding their current economic straits nearly as threatening as the storm. The emergency government support that helped pay for some health care and medically related transportation needs of Puerto Ricans after Hurricane Maria is running out. Private donations of water and food have slowed. And it’s not clear who, if anyone, will carry on with that work. Maldonado opens the cupboards in his tidy kitchen. There are a few cans of corned beef, SpaghettiOs and beans. When I ask him what he usually makes for himself, he sounds wistful. Though the light in Maldonado’s refrigerator still works, power outages during Hurricane Maria broke the mechanism that helps keep food — and the insulin he depends on — cold. But, in truth, the oven is unplugged, there is no juice or eggs or lettuce. It has been months since Maldonado has had fresh vegetables in the house. “When there’s very little, then I kind of go on a diet,” he says. 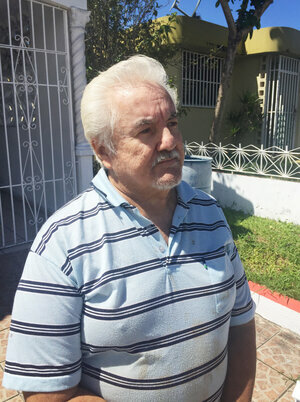 It was hard enough for the retiree to fill his cupboards before the storm, but now, as many aid groups are winding down their donations, Maldonado needs to find money to buy clean, bottled water and to replace his refrigerator, which was ruined during the hurricane. To buy groceries, he must wait two weeks for his next Social Security check. Maintaining a decent diet isn’t simply about staving off hunger; diabetes is consuming Maldonado’s foot, and unless he eats healthy food and takes his insulin, doctors have warned him, his foot will need to be amputated. 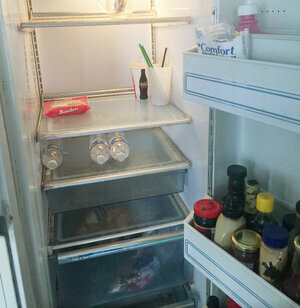 Maldonado opens the door to his broken refrigerator and points to a vial that holds a few drops of insulin — the last of his supplies until he can afford the $3 copay for his refills and find a ride to the pharmacy. “The pharmacist said it could be stored in a dark place [without refrigeration] for a couple of weeks,” he says. Ideally, insulin should be kept cool, but broken refrigerators and a lack of power in many homes in Puerto Rico pose grim hazards for the island’s expanding population of people with diabetes. A visiting nurse, Leslie Robles, shows up for her monthly visit to Maldonado’s home. She examines the 3-inch gaping wound on his foot. They sit at the kitchen table under a painting of The Last Supper and sift through piles of paperwork for Maldonado’s upcoming cataract surgery. Robles tells him that the free medical transportation service that the government made available to large numbers of people after the storm is expiring soon, and he’ll no longer qualify for free rides. What Robles does not say is that the visiting nurse program she works for, operated by VarMed, a health care management company whose services had been paid for by the government, is shutting down too. VarMed has been helping to coordinate medical care, social services and housing for thousands of Puerto Ricans for four years. But, already, in recent weeks, the company has laid off more than 100 nurses and social workers across the island as the local government seeks to overhaul its Medicaid contract with insurance companies. It is unclear how much longer Robles will be able help Maldonado and other patients like him who are on Medicaid and have complex medical needs — the so-called “high cost, high need” patients on the island. The government wants Medicaid-contracted insurers to develop their own programs for these patients, but the earliest that would happen is this fall. In the meantime, Maldonado says he has no one to help him grocery shop, fill prescriptions and get to doctor’s appointments; the volunteers who helped him survive Hurricane Maria are returning to their own lives. In many ways, he, too, is returning to the same spartan life he had before the storm. But with a weakened island safety net that continues to unravel, and with his own health increasingly tenuous, Maldonado feels alone. Sarah Varney is a senior national correspondent at Kaiser Health News, a nonprofit health newsroom that is an editorially independent part of the Kaiser Family Foundation.